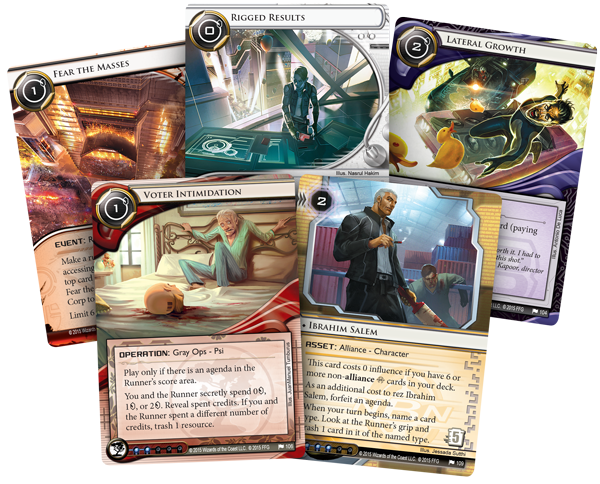 Fantasy Flight Games is proud to announce the upcoming release of Fear the Masses, the sixth and final Data Pack in the Mumbad Cycle for Android: Netrunner! Election Day is here! And the impression its events are about to leave upon the citizens of the Indian Union will carry forward for many generations. Featuring some of the most potent and deck-defining cards from the whole Mumbad Cycle, Fear the Masses carries the cycle to its climactic conclusion… but leaves it to you to deal with the fall-out. 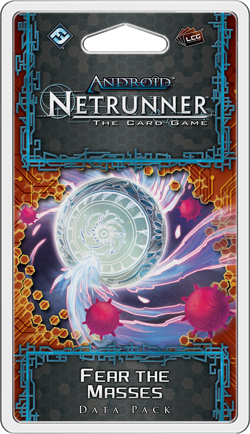 Amid the Data Pack's sixty new cards (including a complete playset of nineteen different cards), you'll find plenty to excite fans of both NBN and those Runners who identify themselves as Anarchs. As Fear the Masses pushes the Mumbad Cycle into the streets of Navi Mumbai, Mumbad's entertainment capital, NBN gains a new identity, a new region upgrade, and two potentially game-changing assets. Meanwhile, as they march against Corp HQs, the Anarchs rally the masses toward dissent and high-pressure discard strategies. 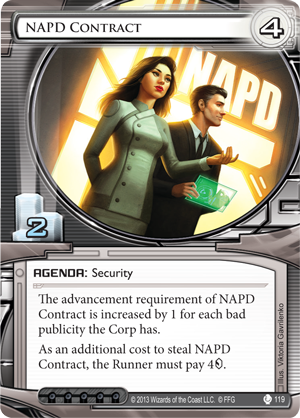 Of course, there's plenty for every faction, including neutral cards for the Runner that give you good odds of bypassing Corp ice for free and a neutral agenda for the Corp that's worth two agenda points, but requires only three advancement to score. There's an old adage that suggests you shouldn't keep all your eggs in one basket, but whoever came up with that one hadn't had an opportunity to visit a Full Immersion RecStudio (Fear the Masses, 108). When you install Full Immersion RecStudio into a server, it offers you the rare ability to double-down on that server, loading it with agendas and assets that play off each other and guarantee that your server is bound to result in something good. 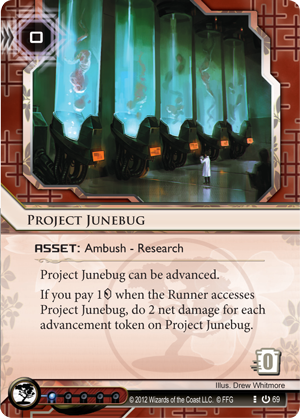 You want to advance an ambush like Project Junebug (Core Set, 69), hoping to bait the Runner into a face full of net damage? 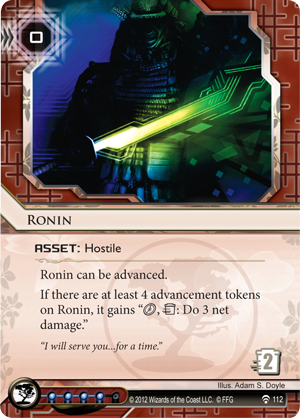 With Full Immersion RecStudio, you can refresh the lure, as well as the threat of net damage, by installing a hostile asset like Ronin (Future Proof, 112) and advancing both assets at intervals. Of course, you can also hedge your bets by installing a trap alongside an agenda. It always hurts to triple-advance your NAPD Contract (Double Time, 119) only to watch the Runner steal it. 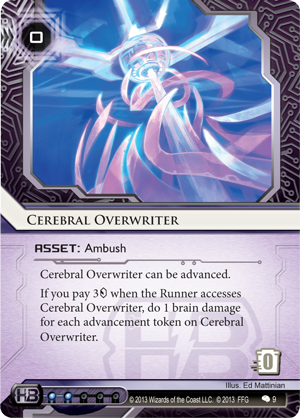 However, it hurts a lot less if the Runner doesn't just have to pay the four credits to steal your NAPD Contract, but also has to access your triple-advanced Cerebral Overwriter (Creation and Control, 9) and suffer three brain damage. So, if you play your Full Immersion RecStudio properly, you win whenever the Runner accesses the cards it hosts. But you also win if the Runner accesses the Full Immersion RecStudio and trashes it without first accessing its hosted cards. In this case, the Runner might not spring your ambush, but any hosted agendas go to Archives… where they don't fuel the Runner toward victory. 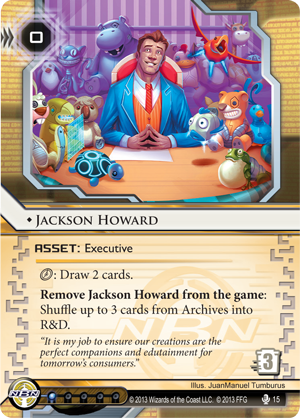 A little bit of Jackson Howard (Opening Moves, 15) magic, and you can tuck those cards safely back into R&D—far, far, far away from prying eyes. And what does the Runner get for all of this? 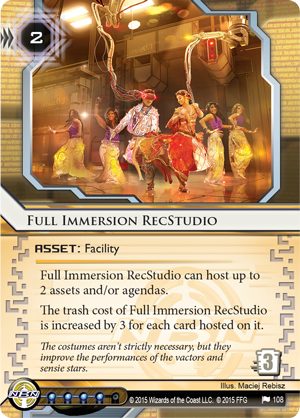 The Runner gets to pay the nine credits it costs to trash a Full Immersion RecStudio with two assets and/or agendas hosted on it. In Hinduism, bhagats are holy men who lead humanity toward faith and point out the world's injustices. 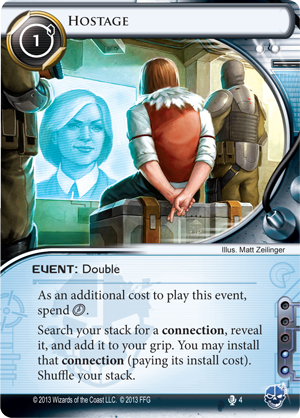 In Android: Netrunner, Bhagat (Fear the Masses, 96) arrives as a three-cost Anarch connection with an influence cost of four and artwork that depicts a shirtless protestor standing atop an abandoned vehicle while fires blaze in the background. "The first time you make a successful run on HQ each turn, force the Corp to trash the top card of R&D." 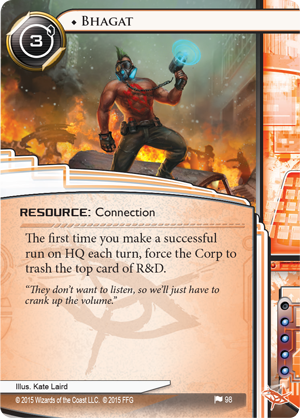 In Android: Netrunner, the Corp player loses if he ever needs to draw a card after his deck (or "R&D") is reduced to zero cards, so when your Bhagat is discarding one card from the top of his R&D each turn—and you're eating away at his maximum number of available turns—the Corp player is bound to feel constrained. Ideally, this may help you install a bit of fear or panic into your foe, but even if it doesn't, you're adding cards to Archives that may be agendas that you can access there later in one big points grab. 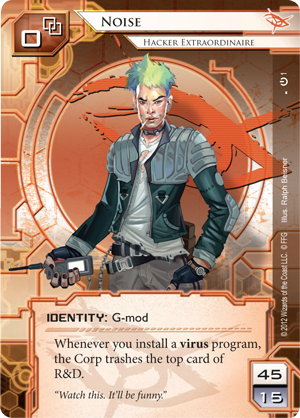 This is how one typically plays a "mill" deck, such as one runs with Noise (Core Set, 1) and a host of virus programs, and to that end, Bhagat can serve as another piece of the puzzle. However, because he typically likes to spend click after click installing his viruses, rather than running, Noise isn't necessarily the best Runner identity for your Bhagat. And even when Noise does run, it's not as often against HQ as it is against R&D or Archives. 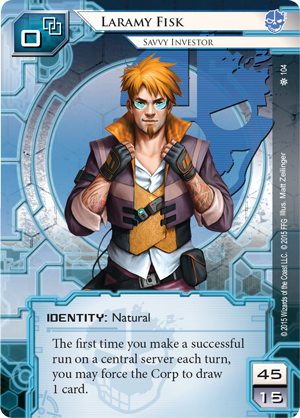 Indeed, your Bhagat, despite his Anarch tendencies, might well be best placed within a Criminal deck, such as one featuring savvy investor Laramy Fisk (The Universe of Tomorrow, 104). 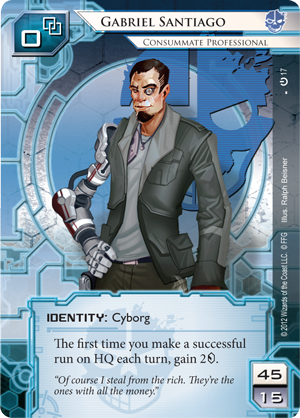 After all, Criminals are notorious for their runs against HQ, a well-documented pattern of behavior that dates all the way back to the Core Set and Criminal identity Gabriel Santiago (Core Set, 17) and one that owes largely to the fact that the Criminal event Account Siphon (Core Set, 18) requires successful runs on HQ. 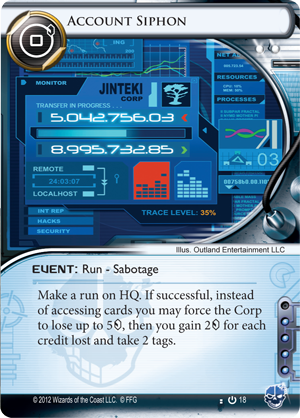 So with Bhagat and Account Siphon, you get double-duty for your runs on HQ; you're stealing credits and milling cards. And if you add Laramy Fisk to the mix, you're not just milling one card, you're effectively milling two. 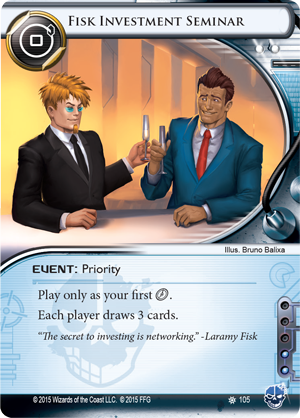 Then, you add a few copies of Fisk Investment Seminar (The Universe of Tomorrow, 105), and you're immediately putting the Corp player on a very short timer. Of course, if you choose to run Bhagat in a Criminal deck, you will probably want to make room for a few copies of Hostage (Opening Moves, 4), rather than using up all your influence on multiple copies of Bhagat. Even so, you won't have enough influence for the full six-card playset of Fear the Masses (Fear the Masses, 96) that you could potentially pair with Bhagat in an Anarch deck, which begs the question: once we arrive to the end of the Mumbad Cycle, are we more likely to see Criminal decks that "mill" like Anarchs, or Anarch decks that target HQ like Criminals? The Mumbad Cycle and the Indian Union's National Elections reach their climactic conclusions in Fear the Masses, and the Data Pack's cards are every bit as thrilling as the election's results. How will it all end? 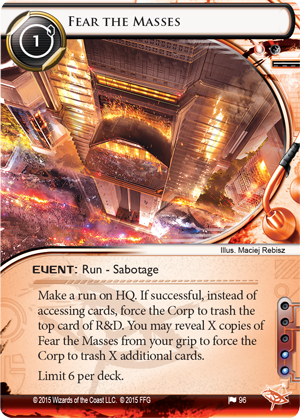 Fear the Masses is scheduled to arrive at retailers in the second quarter of 2016!